Five Fundamentals For Fighting inFLUenza! Marching toward basketball mayhem, I was not thinking about five fundamentals for fighting influenza! That changed quickly after my middle-of-the-night major coughing episode. Influenza was a very rude intruder into my life! Yes, the influenza vaccine doesn’t always prevent the flu! My March Madness brackets would have to wait! As a RA (rheumatoid arthritis) patient, my immediate thought was to minimize this assault on my body. With a compromised immune system, someone with RA has special considerations to take into account, which I did. I didn’t want an arthritic flare brought on by the viral infection. To keep it simple, I employed five fundamentals for fighting the influenza bug. Influenza is a highly contagious respiratory infection involving the nose, throat and lungs. It is thought to be spread by droplets in the air after coughing or sneezing or by touching a surface the droplets land on followed by contact with a mucous membrane, such as nose, mouth or eye. From exposure to having symptoms usually take one to four days. A person is unfortunately infectious about a day before symptoms appear and for up to about 7 days after becoming ill. Being contagious before symptoms appear adds to the infectious nature of the influenza bug as one could be spreading the infection before they know they have the infection! I was instructed I would no longer be contagious 24 hours after my temperature returned to normal. I like to play it safe, so I wore a mask for a few extra days if I went out in public. I figured it protected other people from my infection and it protected me from other potential infections. Fundamental One: Rest, Rest and More Rest! This will not be difficult to do as you won’t feel up to doing much for several days. I would get up from resting every few hours just to move my body around so my joints wouldn’t get stiff. This also helps prevent blood clots. The first three days were definitely the worst. I coughed so hard my chest hurt, my head hurt and I was miserably congested. When I got up every few hours to move around, I seized the opportunity to drink as much water as I could. I lost my appetite, so I purposed to eat as nutrient dense foods as possible such as bananas, oranges, chicken noodle soup, beef vegetable soup, oatmeal and peanut butter toast, knowing you don’t feel up to cooking! I also drank hot tea and fruit juices. Traditionally, I lose my appetite when I get a cold, then regain it when I feel better, so the loss of appetite didn’t concern me. As a RA patient on a biologic, my immune system is compromised, so my doctor ordered generic Tamiflu twice daily for 5 days. The Tamiflu is thought to lessen the severity of the infection and perhaps shortens the course. It was worth it for me to take for those reasons. 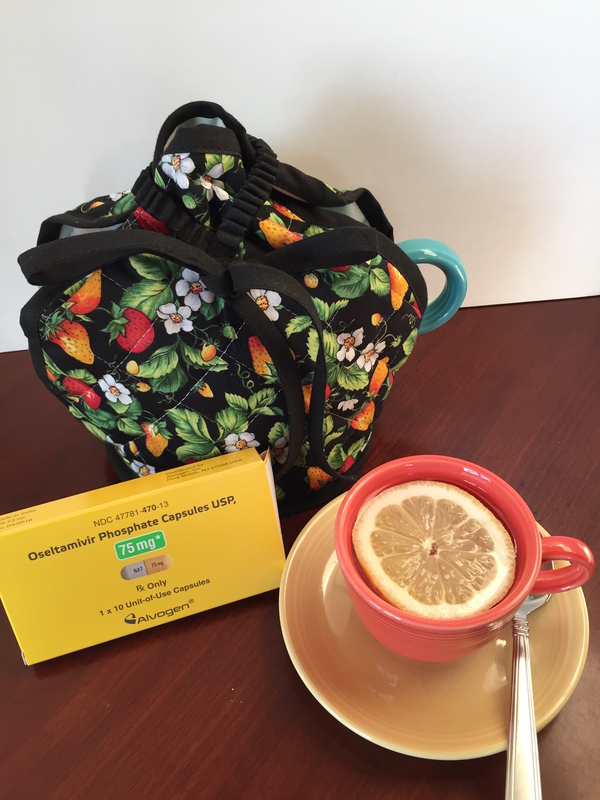 The Tamiflu requires a prescription and is available generically. Fundamental Four: Stop the Spread of Germs! Cover your nose and mouth when coughing, sneezing or blowing your nose with a tissue, then discard the tissue! Avoid contact with others as much as possible! Fundamental Five: Wash Your Hands Often! Washing your hands for 20 seconds is suggested. My motto was, you can’t wash your hand too often! An alcohol based hand sanitizer is an option to use. I began to feel better after about five days. My doctor and I decided I’d hold my biologic for a week to allow my immune system some recovery time, but that is an individual decision each person needs to make with their own health care provider. I was so thankful the influenza did not cause my joints to flare. Using these five fundamentals allowed me to rest, stay hydrated, take an antiviral medication, stop spreading the germs and hand washing frequently aiding my recovery. I wanted to do everything I could to help my body heal. 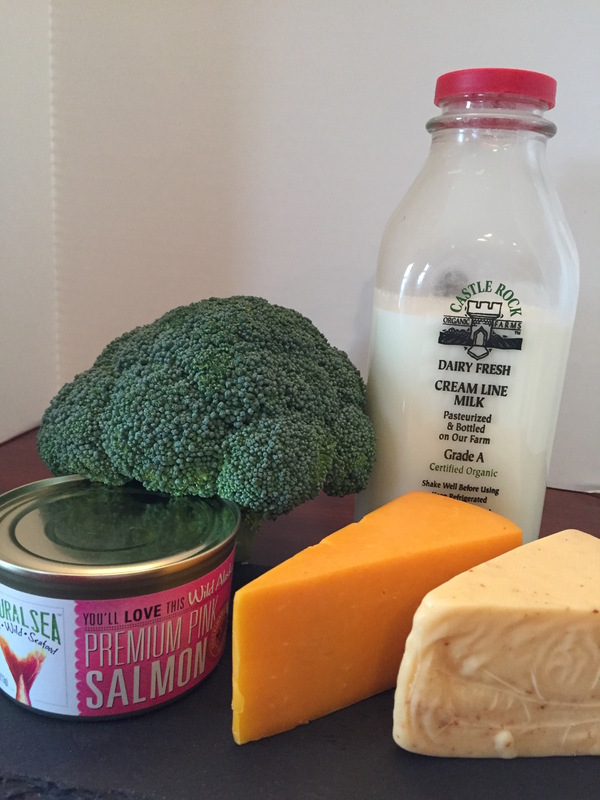 Calcium is in milk, cheese, canned wild salmon with soft bones, green leafy vegetables and broccoli. Calcium, the most abundant mineral in the body, is key for bone health. As a person with RA (rheumatoid arthritis), I’m interested in all things structural in my body! I have joint issues, so my goal is to support those joints as much as possible! Because I took prednisone for years, I want to counter potential osteoporosis in every way I can. One way is to make sure I am getting the proper nutrients to ensure the best bone health I can! Two sources of calcium are food and manufactured supplements. I like nature’s way best! I reason we were meant to get nutrients in the foods we eat. Foods rich in calcium include dairy products such as milk, cheese and yogurt. Green, leafy vegetables such as broccoli make the cut as well as canned salmon with soft bones. Some breakfast cereals and certain brands of orange juice have been enriched with calcium. There has been discussion for years in the pharmacy world about just how well absorbed are the calcium supplements. I figure, stick with nature when possible as it can’t be beat! It is best to get our daily requirement of calcium from foods. Calcium is absorbed through the wall of the small intestine into the blood stream. Vitamin D is required for absorption, as I covered previously and you can read about here. Calcium is 99% stored in bones and teeth to strengthen them. The other 1% is distributed throughout the body in blood, muscle and the fluid that bathe cells. Serum calcium is carefully controlled. Bones and teeth are used as a repository to maintain the control. Bones undergo constant resorption and deposition of calcium into new bone. The balance of this dynamic changes with age. Bone formation tops resorption in children and adolescents. During early and middle adulthood, the process equals out. Then, in aging adults, particularly postmenopausal women, bone breakdown outpaces it’s formation resulting in loss of bone that increases risk of osteoporosis over time. As an RA patient, I’m paying attention at this point! According to the National Osteoporosis Foundation, the amount of calcium needed daily depends on age and gender. For the lactose-intolerant, there are two calcium supplements to help meet the daily calcium requirement. Calcium carbonate and calcium citrate. Calcium carbonate is the most widely available product. It is the ingredient in chewable antacids. It is less expensive than the citrate formulation. It should be taken with food because it needs stomach acid for better absorption. A maximum dose of 600mg should be taken at one time because above that dose, absorption diminishes. It is more advantageous to take one tablet twice a day than to take two tablets at once due to this absorption issue. Calcium citrate is absorbed with or without food, so take your pick! The carbonate seems to have more gas, bloating and constipation side effects. I do want to mention to be sure when you start a new medication and take a calcium supplement, ask your pharmacist if the two interact. Calcium carbonate can cause a pH change and it is a divalent cation, therefore does have the potential to interact with other medications. A reasonable remedy would be timing the doses, this is something your pharmacist would be happy to advise you on. Vitamin D is called the sunshine vitamin! 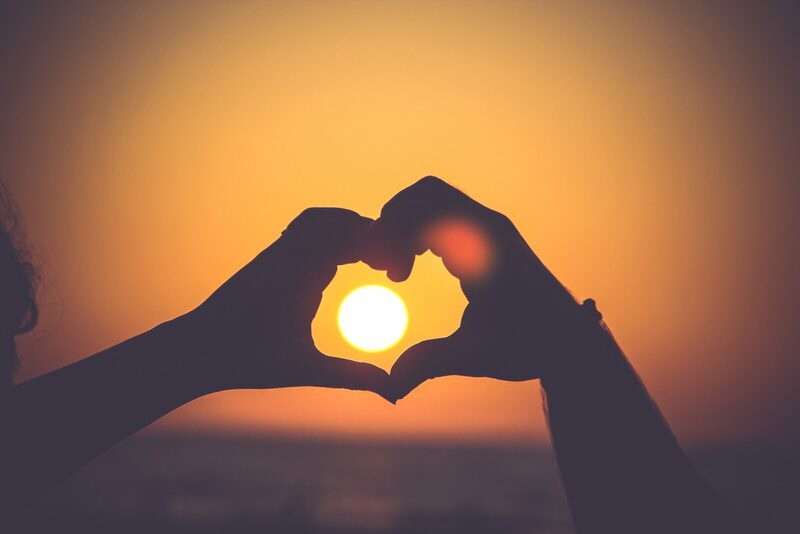 One reason to love sunshine is it’s role in producing vitamin D in our body. That is why it’s called the sunshine vitamin! Vitamin D is getting a lot of attention these days for all the good things it does. It promotes calcium absorption, which is important for building bones. It is said to be involved in modulation of cell growth, neuromuscular and immune function and reduction of inflammation. These are of interest to all individuals, but especially for us with RA (rheumatoid arthritis). There are three ways to get vitamin D, a fat soluble vitamin. Sunlight, food and supplements are the three ways. Let’s talk about each of them. Sunshine doesn’t contain vitamin D, but it promotes the synthesis of it in our body. When our skin is exposed to UVB light rays, the rays penetrate the uncovered skin and convert cholesterol, a cutaneous chemical, into vitamin D3. Vitamin D3, referred to as cholecalciferol, is the most biologically active form of vitamin D. (The other form is made by plants called vitamin D2, or ergocalciferol.) It is suggested that 10 to 15 minutes of sunlight exposure a day supplies the daily recommendation of vitamin D. Those of us living north of 40 degree latitude, (that would be north of Pittsburgh or Salt Lake City), don’t get sunlight strong enough to produce vitamin D in the winter months to meet this recommendation. Sunscreen would be a factor, as well, as it filters out UV rays. For that reason I look to the other two sources to augment the amount of vitamin D I get from sun exposure. Very few foods in nature contain vitamin D. Salmon, tuna, and egg yolks are some. Milk, some brands of orange juice and some dry cereals are fortified with vitamin D.
Vitamin D supplements are available over-the-counter and by prescription only, depending on the strength. Vitamin D is included in many multiple vitamins. Over-the-counter strengths are from 400 International Units (IU) to 5,000 IU per tablet. You can get both vitamin D2 and Vitamin D3 at a dose of 50,000 IU by prescription. The test measuring vitamin D levels in the body is the 25-hydroxy-vitamin-D blood test. It is measured in nanograms per milliliter. In general, you want your level to be between 20 and 50 nanograms per milliliter. There has been active debate on this issue and if you’d like to read more, here is an article for you from Harvard Publications! Vitamin D deficiency can lead to rickets or osteoporosis. Osteoporosis is a potential problem for those of us with RA to begin with. Taking prednisone can lead to weakened bones. I took prednisone for years, so I am definitely cognizant of my vitamin D intake, remembering it is needed for calcium absorption. Because Vitamin D is a fat soluble vitamin and can be stored in the body, it is possible to get too much. That rarely happens and is usually caused by high dosing supplements. I love to see how nature provides for us! I am amazed by how our body synthesizes vitamin D from rays of sunshine. What is not to love about that! So, we have these three sources of vitamin D. Although few foods contain the sunshine vitamin, the daily recommendation should be obtainable with a little sunshine and supplementation. And that is using Arthritis Wisdom!